Note: This article ran in the February 28, 2017 print edition of The Jerusalem Post. It appeared without hyperlinks in the text and was added here by the author for clarity. The biggest news to come out of Prime Minister Netanyahu's visit to Washington is not what grabbed most headlines. Rather, it was his decision to ask the U.S. to recognize Israel's sovereignty over the Golan Heights. It comes at a time when U.S. President Trump is seeking to reinvigorate relations with its Middle East allies and entertaining new strategies to solve a myriad of challenges facing the United States. In that context, Netanyahu's idea should prompt more than a casual review from Washington. Israel captured two-thirds of the Golan territory from Syria in the 1967 war and annexed it in 1981 to the international community's consternation. 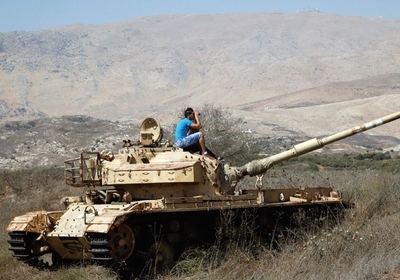 The strategic highlands represented less than one percent of Syrian land area, yet under their control it served as a forward operating position where Syrian artillery regularly shelled northern Israel and the Palestinian Fatah organization launched regular cross-border raids. What the Trump administration decides to do about Syria necessitates an even more important decision about Russia. Seeing clearly where Russian President Vladimir Putin's interest intersect with or diverge from America's will serve as a keystone in crafting a coherent, wider Middle East strategy that fulfills Trump's twin objectives of destroying the Islamic State (ISIS) and pushing back against Iran. At the same time, Washington's definition of Moscow's regional role will have direct implications for Israel's security posture and intelligence sharing. There are several reasons why recognizing the annexation of the Golan Heights would benefit both the U.S. and Israel. Whether the previous Syrian-Israeli peace attempts were conducted under Hafez Assad during the 1990s and 2000, or overseen by his son Bashar in 2008 and 2010, the results were the same: the Syrian leaders demanded more than either Egypt or Jordan received in their agreements, while offering significantly less in return. In essence, they were asking Israel to pay a premium for several additional decades of Syrian belligerence. The initial attempts at making peace under the Obama administration shifted from the land-for-peace formula to a land-for-realignment theory where it was believed that Syria could be flipped from the Iranian orbit. The idea that Tehran and Damascus merely shared a marriage of convenience was absurd at the time. President Obama's later decision to "respect" Tehran's "equities" in Syria demonstrated his belated understanding that Assad's rule in Syria was a core Iranian interest. At this point, there is nothing Syria is able to offer Israel or the U.S. that couldn't be secured by engaging with Russia or Iran instead. In fact, the risk of returning the Golan Heights should be measured against the fact that Iran is actively setting up another forward command along Israel's border with Syria. It comes at a time when Israelis are acutely aware that the reward for giving up land has been the shower of rockets and mortars from Hezbollah in southern Lebanon and Hamas in Gaza. Had Israel accepted Hafez or Bashar Assad's previous territorial demands for peace, Iran, Hezbollah, or ISIS would be threatening Israel today from their perch along the Golan plateau. Weakening Iran's hand in Syria and beyond is also beneficial for the U.S. given President Trump's professed desire to come to an understanding with Russia. The moment has arrived for the Trump administration to realize that Putin's interests do not align with America's. Russia's latest arms shipment to Syria—the largest to date since they sashayed into Syria unopposed by the previous U.S. administration in 2015—is not designed to crush ISIS. Its purpose is to keep Assad in power, provide security for its Iranian client, and increase the Russian threat to NATO's southern flank by upgrading and expanding its Mediterranean base in Tartus, making its presence a permanent feature in the Middle East. Putin's message to the U.S. is clear: Russia is back, prepared to defend its former Soviet client state, and all roads to solving the conflict lead to Moscow. With that understanding should come the realization that prying Russia apart from Iran through bilateral discussions is likely as vacuous as the hope Syria could be flipped from Iran. As Hudson Institute Senior Fellow Lee Smith points out, these are strategic partnerships, not marriages of convenience. The way to change the Russian-Iranian dynamic isn't by talking to Putin; it's by devaluing Iran as a strategic asset to Moscow through sanctions, clandestine operations, cyberwar, and a variety of other measures. Capitalizing on Netanyahu's idea will help the U.S. limit Russia's reemergence as a Middle East powerbroker after a 40-year absence. Rather than being encouraged by the Obama administration as a result of a self-inflicted "red line" wound, their influence will be checked against American interests. That is not to say that Washington and Moscow cannot cooperate where their interests align. Destroying ISIS should be a common goal. But the days of supporting a fundamentally flawed nuclear deal with Iran by giving in to Vladimir Putin, Ayatollah Ali Khamenei, and Bashar Assad are over. Yet another benefit from recognizing the Golan Heights as Israeli is the manner in which it could help reset the moribund peace process with the Palestinians and provide new options for U.S. Senior Presidential Adviser Jared Kushner. It removes the idea that the June 4, 1967 lines are sacrosanct in peace agreements while lessening the damage caused by the recent anti-Israel UN Security Council (UNSC) resolution. That unreasonable decision not only fixes those lines as the starting point for negotiations but also entitles Palestinians to pre-1967 Israeli territory as a part of mutually agreed land swaps. This approach mistakes the possible outcome of negotiations with the starting point of peace talks. It's no wonder, then, why the Palestinian Authority prefers to avoid direct negotiations with Israel. They pocket benefits and concessions as a reward for their avoidance and belligerence. UNSC Resolution 242 has long served as the cornerstone of Middle East peacemaking and it called for the return of territory (not all territory) in exchange for peace. At this point, Israel has returned 80 percent of the land it gained in the 1967 war. Syria has missed the boat; the ship has already sailed. Regarding the Palestinians, the depth of the Israeli withdrawal from the West Bank may only match the depth of peace they are offered. Much has changed since the disintegration of the Soviet Union and convening of the Madrid Peace Conference over a quarter century ago. American policy should also adjust to reflect the lessons learned from past successes and failures. Israel is no longer perceived as enemy number one by the rulers of the Arab states. While they would no doubt oppose an American recognition of the Israeli Golan Heights, they have a better understanding of their priorities and would be more accepting if presented as part of a region-wide plan that works in their favor. Besides, given the choice between aligning with Russia or a reanimated America determined to reward its allies and push back against its adversaries, most Arab states will likely lean to the west. With the changing of the guard in Washington comes the pursuit of new objectives in Syria, the region, and beyond. America has pushed the land-for-peace boulder uphill for decades and reached a point of diminished returns. There should be penalties rather than rewards for truculent defiance, whether Syrian or Palestinian. Netanyahu's request for the U.S. to recognize Israel's annexation of the Golan Heights represents a bold move that would help accomplish several American objectives in the Middle East, while jettisoning policy prescriptions that have long lived past their expiration dates.